Toronto-based Grand Communities has partnered with award-winning architect Stephen Hunt to design the homes at its Metropolitan Towns development in Pickering. 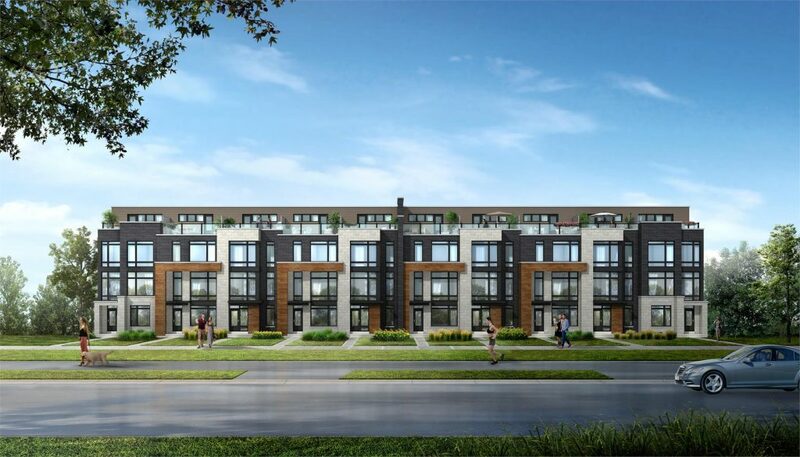 The exclusive community of 28 luxury townhomes is located at Kingston Road and Rougemont Drive and offers prospective homebuyers contemporary design, modern interiors and convenient amenities. Renowned for his trend-setting home designs and careful attention to detail, Stephen Hunt and his team have created a sleek collection of townhomes to complement today’s modern lifestyle. The homes are available in two distinct styles, including inward facing traditional towns and innovative rear lane towns. The traditional towns sport a classic front elevation with energy efficient glazing, glass panelled garage doors, rear decks and convenient walk-outs to generously-sized backyards. The rear lane towns move the garage and driveway to the rear of the home allowing for a larger and open front yard. The modern layout also includes rear terraces and spacious rooftop decks. Both styles boast elegant facades clad in brick, warm wood detailing, rich stone and renaissance stone window surrounds. Colour co-ordinated soffits, fascias, eavestroughs and downspouts complete the look while adding to the neighbourhood’s cohesive streetscape. Inside, the open concept floorplans impress with nine foot ceilings, lush European ceramics and beautiful engineered hardwood floors. The contemporary aesthetic is echoed in the high-end features and finishes including floating staircases with glass panelled railings, gas fireplace, chrome door handles and hinges and molded panel passage doors. Designed with the gourmet chef in mind, kitchens are both stylish and functional with high end cabinetry, thick quartz countertops and ceramic tile backsplash. A stainless steel appliance package is also standard consisting of a glass top range, refrigerator, dishwasher and over-the-range combination microwave and hood fan. Upstairs, floorplans feature spacious secondary bedrooms and expansive master retreats with full ensuites and walk-in closets. Located within one of Pickering’s most desirable areas, residents of Metropolitan Towns will be close to an abundance of urban amenities. The community is surrounded by a selection of local shops, schools and restaurants including Bruno’s Signature Butcher Shop, Blaisdale Montessori School and Kathryn’s Bar & Grill. The pristine beauty of the Rouge Valley National Park, Petticoat Creek Conservation Area and the scenic lake front of Frenchman’s Bay are also just around corner, providing an easy getaway from the hustle and bustle of the city. Prices at Metropolitan Towns start from the $700,000s. To learn more about the development and to receive details on the floorplans, site plan and elevations, be sure to register online at metropolitantowns.com. For more information, email info@grandcommunities.ca.